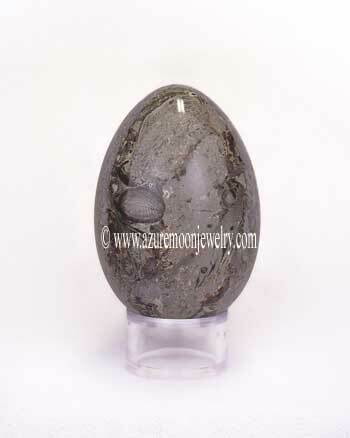 This large, fascinating and highly collectible Nummulite Oceanic Fossil Stone Egg was mined, sculpted and richly polished by hand to a high gloss finish in Pakistan � the home of the highest quality and most beautiful Nummulite Oceanic Fossil Stone in the world. Also known as Nummulite Fossil Stone, Oceanic Fossil Stone, or simply Fossil Stone, it is highly sought after by both beginning and serious gemstone egg collectors and home decorators alike. This exotic Nummulite Oceanic Fossil Stone Egg is an excellent example of these 65.5 million year old sea creatures and how they have been frozen in the sands of time deep within Mother Earth. The beautiful crystalline structure of this egg is slightly lighter in color than it appears and is comprised of putty grey Limestone loaded with dozens of both large and small fossilized, pre-historic Nummulites and other medium to dark putty grey colored sea creatures that swam the shallow waters of the Tethys Ocean 65.5 million years ago. One can very easily get lost looking into this egg and discovering all of the pre-historic sea creatures contained within. This fascinating Nummulite Oceanic Fossil Stone Egg is truly one of a kind and it is an absolute must have for any fossil, or gemstone egg collector! Honestly, the photograph just doesn't due this Nummulite Oceanic Fossil Stone Egg justice! The very subtle blending of shades and minute details that are visible to the naked eye are very difficult to capture in a photograph - it has to be seen in person to be truly appreciated! This beautiful and exotic Nummulite Oceanic Fossil Stone Egg will certainly make an impressive and beautiful addition to any new or existing gemstone egg collection, as well as a wonderful Easter, or spring time display, fabulous kitchen decor, or a thoughtful and sure to be treasured unique gift! And remember - gemstone eggs are perfect for use in crystal healing, chakra therapy, meditation and therapeutic massage too! 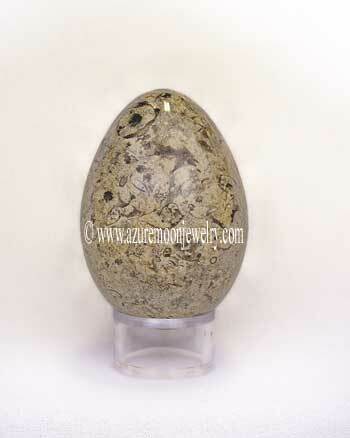 This Nummulite Oceanic Fossil Stone Egg is the size of a duck's egg and measures approximately 2 15/16� L - 2� W and weighs 276 grams or 1380 carats. The crystal clear acrylic display stand is included. Please note that there are a few very, very fine scratches around the very top of this egg that were not polished out during the finishing process. They do not detract from its beauty, but we need to mention it none the less and we've discounted the price accordingly. Please note that this is a 100% natural, polished Nummulite Oceanic Fossil Stone Egg with some small natural flaws and inclusions that occurred during the Limestone's growth process which add interesting and unique characteristics to the gemstone. Said natural flaws and inclusions are not considered a defect, but rather a characteristic of the natural beauty and wonder of the earth's geology. Nummulite Oceanic Fossil Stone is a form of Limestone that contains Nummulites - a long extinct species of lens-shaped, single celled marine organisms that were abundant during the Paleogene and Neogene periods (65.5 million to 2.6 million years ago) and the Eocene Epoch (55.8 million to 33.9 million years ago). During these periods most of northern Africa, including Egypt was covered by the now named Tethys Ocean. Nummulites lived and thrived on the bottom of the shallow areas of this ocean. Then over millions of years their shells piled up, thereby creating the rocks that were quarried by the Egyptians to build the great pyramids and the ancient Egyptians also used Nummulite shells as coins. Metaphysical Properties: Nummulite Oceanic Fossil Stone, as well as all fossils, can be used to both heighten and supplement ones accomplishments in the business realm and to instill quality and excellence within ones environment. It helps ones to dispense with old �programming� and schedules and to be open and receptive to, and perceptive of, the fresh innovative forces with are available. Click here to learn more about the lore and metaphysical properties of Nummulite Oceanic Fossil Stone and other popular gemstones.